MRI evaluation of internal auditory canal, 7th 8th nerve complexes and inner ear done by means of 3D-FIESTA Sequence. The 3 D reconstruction of inner ear done with post-processing by maximum intensity projection(MIP) and multi-planar reconstruction(MPR) where as thin axial sections combined with 3 D reconstruction of inner ear by using 3D-FIESTA sequence precisely show IAC with 7th 8th CN Complex, Trigeminal CNs and Inner ear as well as the relationship between lesions and structures in and around IAC. 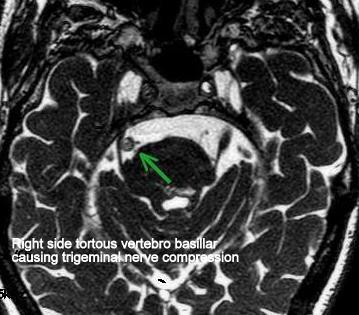 A case of left facial hemi spasm, MRI Brain axial sections of FIESTA shows tortuous left vertebral causing left side 7th - 8th CN complex compression. 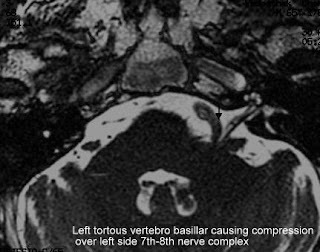 A case of right side trigeminal neuralgia shows tortuous basilar very close to cisternal portion of right side trigeminal nerve causing mild displacement of nerve. What package did you use to create the 3D reformats? Where you able to make the reformats into dicoms? 1. what are the sequences required to image inner ear in 1.5T machine? 2. can u help me with referance material regarding inner ear MRI for my next seminar.